Venue: Murrayfield, Edinburgh Date: Sunday, 15 February Kick-off: 15:00 GMT Coverage: Live on BBC TV, HD, Red Button, Radio 5 live, BBC Radio Scotland, BBC Radio Wales, Radio Cymru, the BBC Sport website, BBC iPlayer, S4C online, mobile, the BBC Sport app and Connected TV; text commentary on the BBC Sport website. 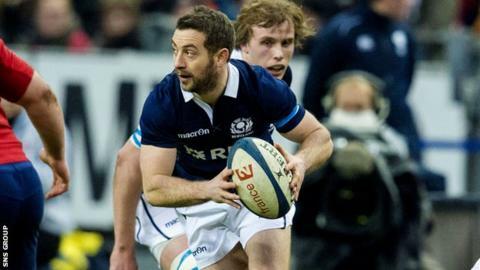 Scotland will use the painful memory of last year's Six Nations mauling in Cardiff as motivation at home to Wales on Sunday, says captain Greig Laidlaw. Wales romped to a 51-3 win following an early red card for Stuart Hogg. "The last time we played Wales we were on the wrong end of a thumping - we need to turn that around," said scrum-half Laidlaw. "It was a bad day for the team, a bad day for the Scottish jersey, and we will be using some of that emotion." Laidlaw described the opening-weekend 15-8 loss to France as "probably a chance missed", and knows victory on Sunday is essential to maintain the mood of optimism in Vern Cotter's squad. Wales are also seeking their first points following a 21-16 home defeat to England and have won their last seven meetings with Scotland. "If we are going to do anything in this tournament, we need to win this weekend," said Laidlaw. "We need to learn from some of the mistakes we made against France and turn in a winning performance but it will be tough against a good Welsh side." The 29-year-old Gloucester scrum-half will win his 35th cap against Wales, who make one change from the side that lost to England. Winger George North has been given an extended recovery period after suffering two head knocks and has been replaced by Liam Williams. "Liam is a good player and has a similar sort of stature to North so not much will change in their game plan," added Laidlaw. "I'm sure they will have some small subtleties up their sleeves but, in terms of their global picture, they do play a certain way. "They've been successful that way, so why would they stop it? "We need to stop their go-forward and be aggressive at the breakdown and the tackle contest, make sure we are fronting up and not giving them easy gain-line. "If we do that, it takes a big part of their game away." Scotland conceded 12 penalties in Paris and the captain plans to speak with referee Glen Jackson in a bid to avoid a repeat performance. "There were a couple of things that went wrong," he explained. "We got caught in a ruck sometimes and the referee gave them a penalty. "Some of their decisions were debatable, some of them were tough. Some of them he gives, some of them are 50/50. "As the game went on, France were able to chip away at us and that cost us the game. So looking ahead to this weekend, we'll speak to the referee before the game and get his interpretations, make sure we're on the right wavelength and hopefully I can talk him round if needed. "But we will just try to be squeaky clean while we can - the best way to deal with it is not give the referee a decision to make."